On my walk from the Royal Foundation of Saint Katharine in Limehouse to Liverpool Street station, I stopped at a number of points associated with the stories of the Jewish East End, including the Congregation of the Synagogue of the Congregation of Jacob on Commercial Road, and Fournier Street in Spitalfield. Christ Church, Spitalflieds, on the corner of Commercial Street and Fournyer Street, also has links with the old Jewish community in the East End, because the memorial plaques from the Jews Chapel in Palestine Place, Bethnal Green, were moved here in 1897 when the chapel closed. Christ Church, Spitalfields, one of London’s outstanding baroque churches, was built between 1714 and 1729 to a design by Nicholas Hawksmoor. The church is on Commercial Street, on the western edge of Tower Hamlets and facing Spitalfields Market and the City of London. This is one of the first and one of the finest of the so-called ‘Commissioners’ Churches’ built for the Commission for Building Fifty New Churches, established by an Act of Parliament in 1711. The Act aimed to provide 50 new churches to serve the new populations on the fringes of London. The commission members included Sir Christopher Wren, John Vanbrugh and Thomas Archer, and Nicholas Hawksmoor and William Dickinson were appointed as Surveyors to carry out the programme. 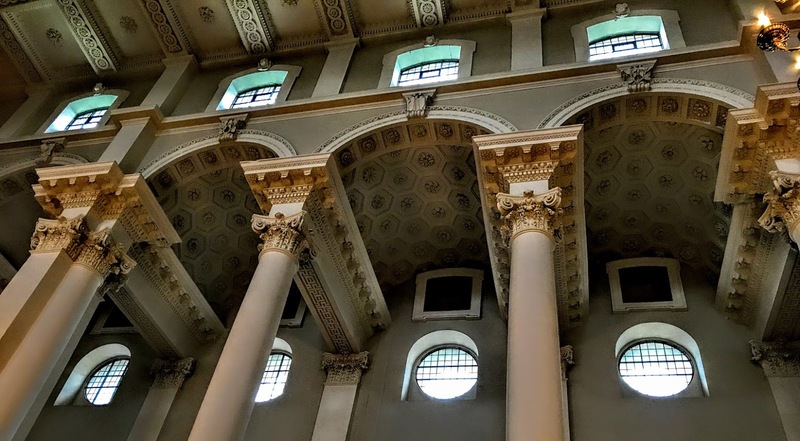 In 1710, the roof of Saint Alfege, Greenwich had collapsed, and its parishioners petitioned the commission to provide money for rebuilding the church. It became the first of the series that Hawksmoor designed. When the programme expired in 1731, only 12 of the proposed 50 churches had been built. 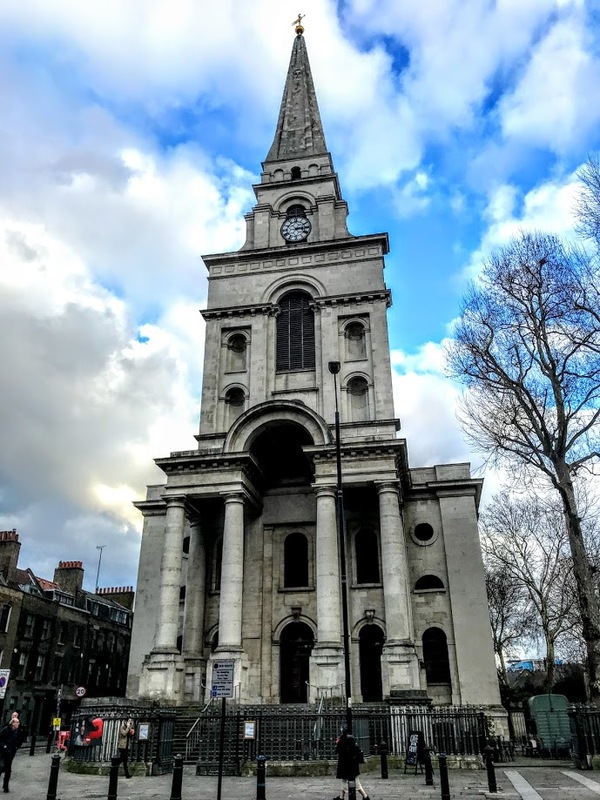 Nicholas Hawksmoor (1661-1736), a former assistant of Sir Christopher Wren, was a leading figure of the English Baroque style of architecture in the late 17th and early 18th centuries. 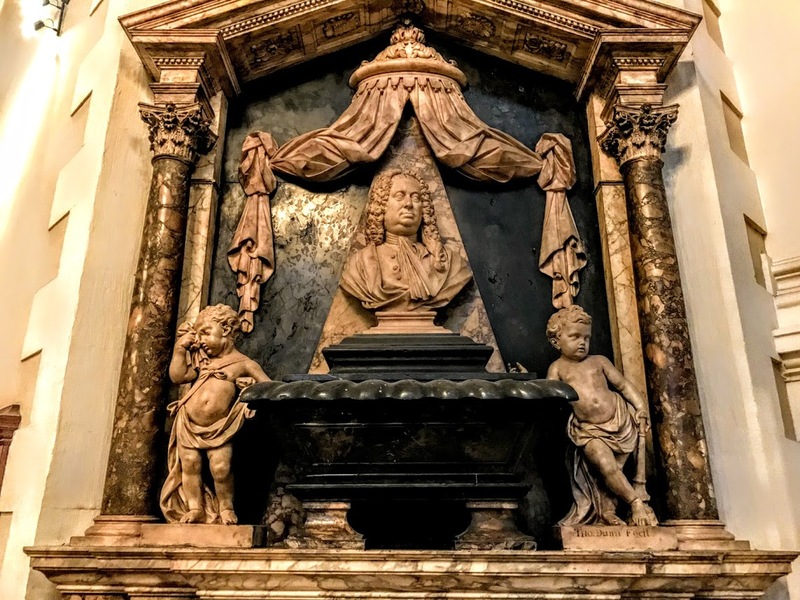 He worked alongside the principal architects of the time, Christopher Wren and John Vanbrugh, and contributed to the design of some of the most notable buildings of the period, including Saint Paul's Cathedral, Wren’s churches in the City of London, Blenheim Palace and Castle Howard. ● Saint George, Bloomsbury (1716-1731). 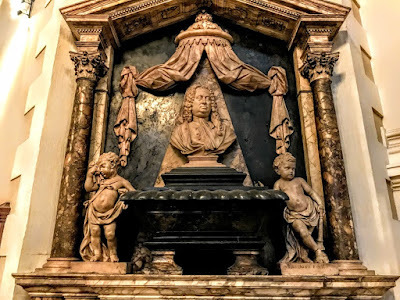 They compare in their complexity of interpenetrating internal spaces with work at the same time in Italy by Francesco Borromini. Their spires are essentially Gothic outlines executed in innovative and imaginative classical detail. The parish for Christ Church, Spitalfields, was carved out of the huge mediaeval parish of Stepney parish for an area then being populated by Huguenots or French Protestant refugees. At first, some Huguenots used Anglican church for baptisms, marriages and burials, but not for everyday worship, preferring their own chapels. But increasingly they assimilated into English life and the liturgical life of the Church of England. Work on building Christ Church, Spitalfields, began in 1715, when the foundation stone was laid by Edward Peck. Edmund Gibson, Bishop of London, consecrated the newly-completed church on 5 July 1729. Hawksmoor’s design for Christ Church shows his usual abrupt architectural style. His very plain rectangular box of the nave is surmounted at its west end by a broad tower of three stages topped by a steeple that is more Gothic than classical. The magnificent porch with its semi-circular pediment and Tuscan columns is attached bluntly to the west end: it may indeed be a late addition to the design intended to add further support to the tower. 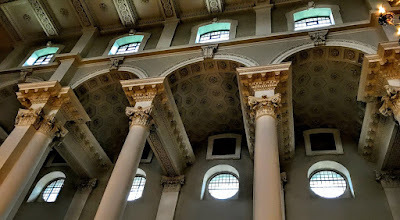 As with Hawksmoor’s other London churches and many of Wren’s churches, the central space consists of the nave and two axes, the shorter originally emphasised by two entrances of which only that to the south remains. It has a richly decorated flat ceiling and is lit by a clerestory. The aisles are roofed with elliptical barrel-vaults carried on a raised composite order, and this order is also used for the screens across the east and west ends. The Venetian window at the east may show the growing influence of the revival of Palladian architecture, or it may be a rhyme with the arched pediment of the entrance portico, repeated in the wide main stage of the tower. The east window is a double window, one inside, one outside, the effect now obscured by the Victorian stained-glass window between the two. The organ installed in 1735 was built by Richard Bridge, a celebrated organ builder of the time, and Handel once played on the organ. 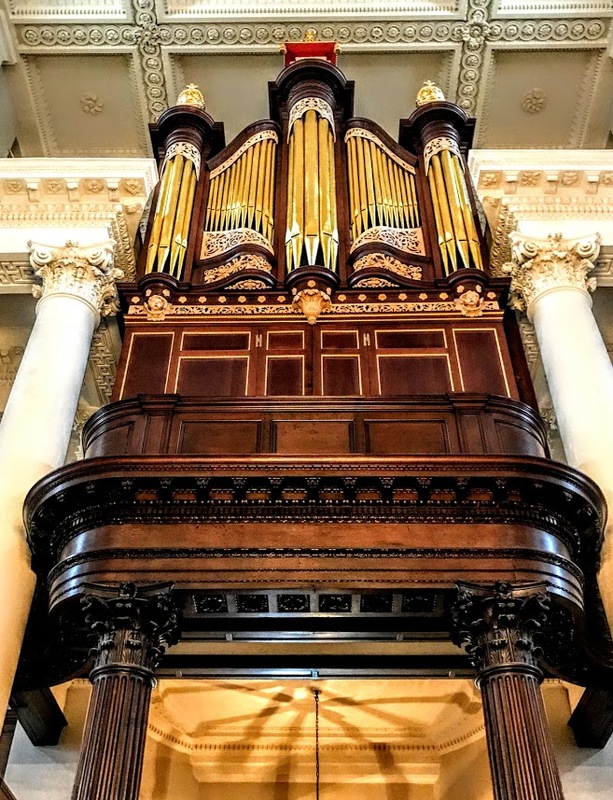 With over 2,000 pipes it was the largest organ in England when it was built, and continued to hold that record for over 100 years. Remarkably, much of the original organ survives, including the Georgian organ case which is largely of walnut. Following a fire in 1836, Wallen Son and Beatson, local architects and surveyors, provided a substantial estimate to repair the church. The church was altered in 1850 by Ewan Christian, the architect of the National Portrait Gallery. He removed the side galleries, blocked in the windows at the corners of the central space, and combined upper and lower aisle windows to make tall, thin windows. The stained-glass windows were fitted in 1876 by Ward and Hughes of Soho. When the Jews Chapel in Palestine Place, Bethnal Green, ten plaques were moved from the chapel and hung in the vestibule of Christ Church in 1897. The London Jews Society, now the Church’s Ministry among Jewish People (CMJ) was formed in 1809. It first worked among the poor Jewish immigrants in the East End, but soon spread to Europe, South America, Africa and Palestine. In 1811, the society leased a five-acre field on the Cambridge Road in Bethnal Green. A school, training college and the Episcopal Jews’ Chapel were built there, and the campus was named Palestine Place. In 1813, a Hebrew-Christian congregation called Benei Abraham (Children of Abraham) started meeting at the chapel in Palestine Place. The missionaries associated with CMJ include the Revd Joseph Wolff (1795-1862), a German rabbi’s son, who was baptised by a Benedictine abbot in Prague in 1812 and was ordained priest in the Church of Ireland in 1838 by Richard Mant, Bishop of Down and Dromore, and the Revd Moses Margoliouth (1820-1881), a former curate of Glasnevin, Dublin (1844-1847), who was born to Jewish parents in Poland and had a rabbinical education. Both received degrees from Trinity College Dublin. 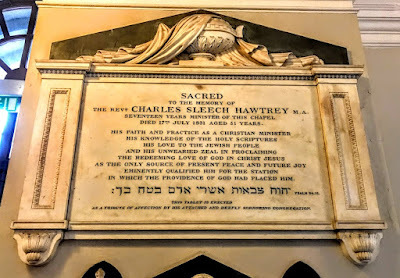 Many off the plaques moved to Christ Church bear inscriptions in Hebrew and include the names of evangelical Anglicans and converted Jews who were ordained. Those named include Jane Cox, who endowed Christ Church, Jerusalem, which still remains outside the jurisdiction of the Episcopal Diocese of Jerusalem – some critics say it is a thorn in the side of the Anglican presence in Jerusalem. During World War II, the crypt of Christ Church was used as an air raid shelter. By 1957, the church was declared unsafe, and the parish Sunday services were moved to Hanbury Hall, a former Huguenot chapel in Hanbury Street that served as the parish hall. By 1960, Christ Church was almost derelict, and the roof was declared unsafe. The then Bishop of Stepney, Trevor Huddleston, proposed demolishing the empty building, but the Hawksmoor Committee staved off the threat of demolition. The roof was rebuilt with funds from the sale of the bombed-out shell of Saint John’s, Smith Square, now a concert hall. 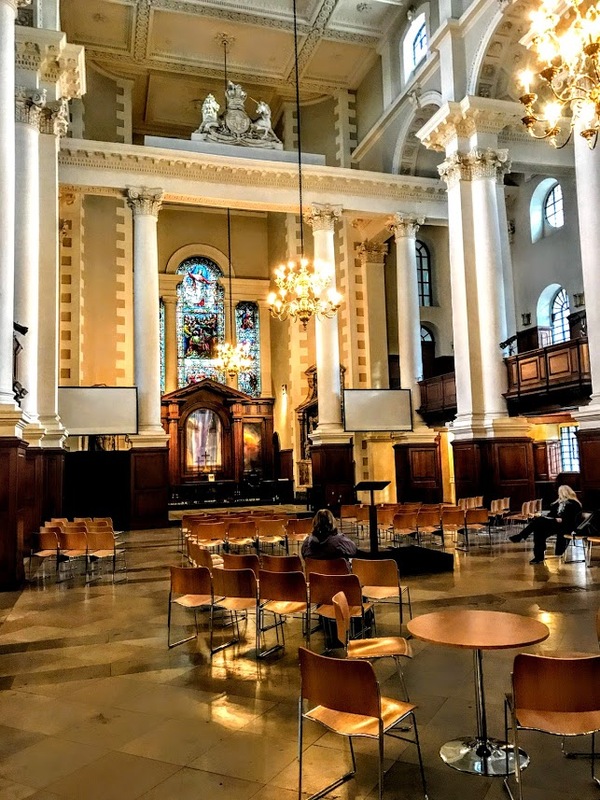 In 1976, the Friends of Christ Church Spitalfields was formed as an independent charity, was formed to raise money and project manage the restoration of this Grade I listed building so it could be brought back into use. As part of the restoration programme, the burial vaults beneath the church were cleared. The Friends of Christ Church raised funds for the employment of an archaeological team, and almost 1,000 burials were excavated in 1984-1986. The portico at the west end was repaired and cleaned in 1986, and Ewan Christian’s rearrangement of the aisle windows was replaced by a recreation of the originals, scrupulously researched. Church services returned to the partially restored building in 1987. The 202 ft tower and spire were consolidated and cleaned in 1997, the south façade was cleaned and repaired in 1999, and Hawksmoor’s double flight of steps on the south side, removed in the 19th century, was rebuilt. In addition, the gate piers of the rectory yard were repaired, and the large iron gates restored. Regency style railings to the churchyard, removed in World War II, were replaced. The north and east façades were repaired and cleaned in 1999-2000. A rehabilitation centre for homeless alcoholic men was housed in part of the crypt from the 1960s until 2000, when it relocated to purpose-built accommodation above ground. The restoration of the interior began in 2000, and the restoration of the building was finally complete in 2004, enabling a wide range of uses to run alongside the primary function of Christ Church as a place of worship. In 2015, the crypt restoration was completed, restoring much of Hawksmoor’s original walls as well as providing a café area. In 2016, the restoration of the crypt was shortlisted in the RICS Awards. Today, thousands of people visit Christ Church, Spitalfields, some to pray, some to marvel at its restoration and its beauty, some to soak up its history.